Welcome to the Wymondham and Edmondthorpe Parish Appraisal report. 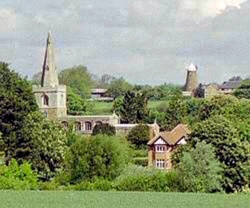 For two years the Parish Appraisal Working Group has been gathering and assessing information, mainly from the questionnaire that was sent out during December 2001, about the different kinds of community, environmental and other local issues that concern the people of Wymondham and Edmondthorpe. From the analysis of the replies to the questionnaire, as well as from discussions and correspondence, it is clear that some issues are seen as very important. These include the volume and speed of traffic through Wymondham; educational and recreational facilities; the upkeep of roads and footpaths; better communication of Parish activities; and the case for housing expansion within the Parish, especially regarding the redevelopment of neglected or derelict sites and buildings. On the positive side, most people were reasonably satisfied with public transport and with the local services provided by, for example, the Post Office and Cottage Stores, the mobile shops and library and the Parish Council. This report is being sent to every household in the Parish, as well as to representatives of the local authorities responsible for the development of planning strategies and the funding of community projects. These and other service providers will shortly be invited to a public meeting at which parishioners can air their opinions on the recommendations of the report and express their views on any new issues or factors that appear important. Thank you for taking the trouble to read this report. The Working Group feels that it is a fair and objective account of the views of the inhabitants of Wymondham and Edmondthorpe, and a good basis for action to meet their most important current needs and aspirations for the future. Wymondham conservation area was designated in 1973 and its boundary covers all of the older built up area and the large open areas to the South West of the village. The village has a long history with evidence of Roman occupation. Listed buildings include the Church of St. Peter, the former Grammar School and the Priory. The Windmill situated to the North of the village is probably the most complete example of a tower windmill in the area, built in 1813 it is now part of a tourism complex. Building materials are mostly natural stone and clay pantile roofs. Historically, development in the village has largely concentrated to the South of Main Street. Further development in this area is restricted by the poor standard of access provided by the narrow lanes. Most of the development has been on infill plots. There have been several houses built in the centre of the village, off Spring Lane and Chapel Lane, but less than 30 houses have been built over the last 20 years. Edmondthorpe is an attractive stone built agricultural village, mostly working farms and related cottages. The village has several listed buildings including the Water Pump, and the Church of St. Michael. Holly Cottage and New Farm were designated in 1994. Hardly any development has taken place for many years. The recommendations in this report are made in the context of a middle-aged to elderly population requiring appropriate facilities and the need to attract and retain younger people and families to sustain the community in the long term. This context has been determined from the responses received to the questionnaire and reflects the population mix of the parish. Recommendations can be found within each section. Altogether, this represents approximately 59% of the total households within the parish. The age distribution of the population of the parish shows a spread across the age range but there is a concentration of people in the 'prime of life' aged between 40 and 59 years of age (37%), as opposed to 0-21 years (25%), 22-39 years (18%), and over 60 (20%). The picture that emerges is one of a stable population with a very low rate of newcomers, 3% had lived in the village for less than one year, yet 45% had lived in the village for 15 years or more. The main reason for this stability appears to be the rural location, 80% said they "liked to live in the country", 7% were born in the parish with 16% returning to the parish. Wymondham is located in a rural setting. When asked if they see the need for further housing in the village 148 people replied. 55% agreed there was a need for further housing and 45% were against. Residents were asked to give their views on where new dwellings should be sited. There was strong support for refurbishment of redundant buildings, e.g. the old station site, village outskirts and infill areas. Whilst there was support for housing on the Space Foods site, this matter remains unresolved. Suggested designs submitted during 2002 are awaiting further refinement. Due to a lack of affordable accommodation 8% reported that members of their family had left the village. A separate analysis, using the data provided from the responses to the Parish Appraisal, was produced and submitted to the Melton Borough Council to assist with their decision-making with regards to future development of the Space Foods site. The analysis is reproduced below and was issued prior to receiving an additional two questionnaires. The authorities (Melton Borough Council) should take into account the views of residents for all future planning applications in the parish (and for a future Local Plan), in particular the support for conversion of redundant buildings for housing and the careful use of infill sites. As a follow-up to this Parish Appraisal, the Parish should start the process to prepare a Village Design Statement by consulting with the Rural Community Council and Melton Borough Council, and forming a working group representing a wide cross-section of the parish. There was very strong support for retaining a wide range of landscaped features. In the main, the majority of people were keen to see the green areas preserved. This included the village greens, highway verges, trees and playing fields. Many people indicated the need to preserve the historic buildings within the Parish and additionally a few specific landmark features were also mentioned e.g. the hollow oak in Edmondthorpe. Eighty-four percent of respondents appreciated and valued the surrounding countryside. Out of the 143 that responded to the question of a Village Design Statement, 66% thought it was a good idea; 11% said no; and 23% didn't know. Residents were asked how often they used the footpaths. Out of the 152 who responded, 45% used them three or more times a week; 28% used them weekly; 23% monthly; and 4% never. Sixty percent of households consider this to be a major environmental issue. Information: Here's the link to the Melton Dog Warden's page at MeltonOnline. Most respondents were satisfied with the waste collection and recycling service provided by Melton Borough Council. The main issues raised related to the collection of garden waste, i.e. the lack of information about the dates of collection and uncollected bags left at the roadside. Comments made about household waste covered the lack of bags and subsequent collection (24 households), and the need for wheelie bins (11 households). Information: Melton Borough Council (MBC) has recently introduced a new policy. The compost-collection lorry now has compartments to take away those bags supplied by MBC. This does not however apply to your own fertiliser or other bags, which will still be left, uncollected, at the property boundary. The green and grey bags for recycling can be collected from the reception desk of Melton Borough Council. Further to recent press articles on Wheelie Bins, there are no immediate plans to introduce them into Wymondham. Recycling boxes were introduced in April 2003. Melton Borough Council Planning Department should continue to uphold the 'Protected Areas' in the parish to maintain the character of open spaces and green areas and should ensure that buildings that are a feature of the village character are retained. The Parish Council should circulate a note to all dog owners reminding them of the penalties for dog fouling and should install green-coloured 'Doggy Bins' in the village, liaising with Melton Borough Council regarding regular emptying. Melton Borough Council should assess the success of the new recycling storage bins in light of the concerns raised over the previous bags scheme. Village residents should be consulted before launching a wheelie bin scheme. 146 households responded to the question, How important is the school to the parish? 72% thought it extremely important. Of households with pre-school age children, 20 households indicated that they had children and would send them to the local school. On the subject of pre-school provision 36% thought there was enough pre-school provision, 4% disagreed. The other 60% said it was not applicable to them. 75 households replied to the question of the need for more after-school clubs. 72% agreed there should be more of these. 66% thought they should be educational. We then asked for suggestions, the most popular being: Sports; Gymnastics; Choir; Guides and Brownies; and Computers for the Young. Out of 51 households responding, 47% said their children would attend a play scheme during the holidays; 32% didn't know; and 31% said No. Information: A holiday play scheme runs during the summer holiday at King Edward VII School, Burton Road, Melton Mowbray. Parents of children at the village school receive information during the Summer Term. A week long play scheme, held during the summer holidays, has operated in previous years at the Sir John Sedley Education Centre, led by Phil Gaskell (01476 564290). 146 Households responded that they had attended the Parish Church. Of those responding, 101 households indicated that they had attended Easter and Christmas services, whilst members of 99 households had attended a funeral and 72 households had attended a wedding in the Parish. 28 households attend church in another parish. Of these, 29% went into Melton; 13% to Oakham and the remainder elsewhere. 75% of the respondents believed the Church important for Sunday Worship; 46% for Spiritual Guidance; 81% for Baptisms, Weddings and Funerals; and 80% identified the Church as having an historical importance. Information: On the third Sunday of each month, there is an informal All-Age Worship Service in Church at 11:00am in which the children participate and families and young people - of all ages! - are especially welcome. When asked if they regarded the Village Hall as an important amenity, 130 households (91% of those responding) said they did. 128 households responded to the question regarding the parish precept: 80% stated that they were in favour of a precept to support the running costs of the Village Hall. Information: As a result, the Parish Council voted to cover the running costs of the Village Hall through the precept, from April 2002. 103 households make use of the Village Hall. Information: Pam Hickman (787274) should be contacted for Village Hall bookings. Plans are currently being drawn up to refurbish the Village Hall. Subject to consent, it is hoped the improvements to the Hall will provide for a completely revamped surgery, kitchen, bar, toilets and meeting rooms. 62 households make use of the Surgery facilities at the Village Hall. 25 households identified Physiotherapy and Chiropody as two of the services that they would like to see made available at the Village Hall. For an appointment please call the Market Overton surgery (01572 767229) in good time as no medical records are kept at the Village Hall. 60% of those responding said that they would prefer courses to be run in the evening, with 20% opting for the weekend and the remaining 20% preferring the daytime. 79% of those responding said that they were aware of the computer facilities at the Sir John Sedley Educational Centre. 25% of these households indicated that they would like to make use of these facilities. Information: As part of the Leicestershire County Council Youth & Community Education Programme, a questionnaire has been circulated around the parish to assess demand for Adult Learning courses to be run at the Sir John Sedley Educational Centre. These courses will be run under the direction of the Adult Learning Development Group from Bottesford Community Centre. For more information, please contact Pat Peters, 2 Gretton Gardens (Tel. 787358, e-mail patriciapeters@supanet.com). When asked whether people would like to be employed within the village, 61% of those responding said that they would. Of those responding, 96% of households indicated that they did make use of Wymondham Post Office and Cottage Stores. Of these, over half used the store on a fairly regular basis. Information: Newspapers can be ordered through Stella Graham, who currently supplies daily newspapers to a number of Wymondham residents on a self-collection basis. Stella can be contacted on 787273. The Cottage Stores currently provides a delivery service to the elderly. Butcher: David Cox Butchers, Wednesday (11:30 - 12:30) and Friday (13:30 - 14:30). Fish: Rick, Thursday 3:30pm outside Wymondham Post Office. A total of 148 households responded to the questions concerning the Berkeley Arms. Only 22% of households stated that they visited the pub on a frequent basis. Many comments were received about the service provided by the Berkeley Arms. These comments mainly covered the ambience and atmosphere within the pub as well as the type and value for money of the food. Information: The landlord of the pub has changed in the time since the questionnaires were returned. A total of 147 households responded to the questions concerning the Windmill. Only 14% of households stated that they visited the Windmill on a frequent basis. Comments were received with regards to the food served at the Tea Shop, the type and variety of shops on the Windmill site, and the play facilities provided within the Windmill grounds. Information: The ownership of the Windmill and several of the shop tenants have changed in the time since the questionnaires were returned. Recognising the importance of the school to the parish, the Church School Authorities, the LEA and the school governors should take appropriate action to raise the profile and awareness of the school in the local area in an attempt to increase pupil numbers and ensure the future of the school. As a number of After-School Clubs have lapsed, parent representatives should meet the Head Teacher to discuss the demand and identify volunteers to run and support after-school activities. The Church should note the support for Sunday School and continue to encourage the participation of children in church-based activities. The Church should also note the community demand for use of the church building in providing access and planning future building work. The Village Hall Committee, in designing a new village hall, should note the demand for the Surgery and for additional facilities for physiotherapy and chiropody in consultation with Dr Fenby-Taylor. Based on the wide support for the Village Hall in the community, the Village Hall Committee should press ahead with comprehensive rebuilding/refurbishment of the hall in order to provide a facility appropriate to the parish for the 21st century. The Parish Appraisal provides good evidence for funding opportunities for this work. A total of 145 households responded to the questions within this section. 30% of those responding indicated that they had an involvement with a sports or social group. The overwhelming majority of households (152 answered out of 156) considered traffic to be a problem. The majority of responses indicated that the volume and speed of heavy goods vehicles to be the main concern (88%), with as high a percentage being concerned about the speeds of the cars and vans but not so much about the volume. In addition to these suggestions a further six households indicated the need for speed restrictions over the Edmondthorpe Road bridge. Information: The Parish is nearing the top of the list for funding from Melton Borough Council for traffic calming measures. Discussions regarding the best method of traffic calming will take place with the Borough Council and Leicestershire County Council. A slight majority (51%) felt on-street parking was a problem in the village, the main area for concern being the road from Park Cottages down to Wrights Lane. On the subject of parking, 51% of the respondents thought parking provision in the village to be adequate; 39% thought it was poor. 69 households expressed a view on the bus service to and from Melton, while 45 households expressed a view on the service to and from Oakham. No single cause for concern arose from the analysis, although there were several households who expressed a concern over the routing of the Oakham service. Information: The Rutland Flyer uses Stand 4 on St Mary's Way, Melton Mowbray; and Somerfield supermarket, Oakham. The route between Edmondthorpe and Oakham passes through Teigh; Market Overton; Cottesmore; Greetham; Exton; Burley-on-the-Hill crossroads. From Oakham, the service travels via Uppingham to Corby. There is a free shoppers' bus on Mondays to the Co-Op outside Oakham, leaving from outside the former Newsagents, Wymondham at 09:55 and returning at lunchtime. 59% found the maintenance standard of the roads to be fair, whilst 21% thought it was poor. On the standard of maintenance of the pavements, 59% thought they were fair whilst 20% thought they were poor, but with regard to the back walks, 56% thought maintenance to be fair and 33% thought it was poor. 64% considered that the facilities and safety features for pedestrians were fair; 23% considered them poor. Information: Since the Questionnaire was issued, the Council have resurfaced the footways within Wymondham (Summer, 2002). As a result, a number of dropped kerbs have been introduced, enabling better access for pushchairs and wheelchairs. The lanes off Main Street, Wymondham have been resurfaced, and work on the Backwalks has commenced (Summer, 2003). Report traffic and speed issues to Leicestershire County Council Highways Department (copy to Melton Borough Council, the Parish Council and the Police Authority). Following previous attempts, the Parish Council should again make formal representation to Leicestershire County Council Highways Department to reduce the volume of Heavy Goods Vehicle traffic through Wymondham by imposing appropriate restrictions. The Parish Council should press the Police and the Highways Authorities to install speed cameras and speed display panels at both ends of the village and to consider road markings appropriate to a rural environment in order to reduce speeding through the village. The Parish Council should request priority signs on the approaches to the bridge on Edmondthorpe Road, giving priority to traffic leaving the village. Melton Borough Council Planning Department should ensure that future developments in the parish incorporate sufficient off-street parking space for the occupiers. The Parish Council should again review on-street parking, in particular with the residents where issues have been identified, to see whether suitable alternatives can be provided. The relationship between on-street parking and traffic-calming should also be considered when addressing suitable off-street parking. Leicestershire County Council Planning and Transport Department (Rural Transport Officer) and the Bus Operators, together with the Parish Council, should review the routing between Wymondham and Oakham to determine whether a faster/more direct service can be provided: also to add a late-evening service to/from Melton. The value of the bus service to the elderly should be emphasised. Community transport services provided by Melton Council for Voluntary Services to the elderly; the disabled; and youth groups should be explored to expand the range of opportunities for these members of the parish. 141 households responded to the question of how often they used the mobile library, with just 22 households actually using the service. 89% wished the frequency of the service to stay the same; 42% thought the stock was good; and 47% thought the stock to be reasonable. Information: You can join the mobile library on the vehicle. The library comes every other Friday, and stops outside the former Space Foods' site (15:05-15:15); the Berkeley Arms (15:20-15:35); and at the top of Sycamore Lane (15:40-16:10). Videos and CDs are available for hire and, along with books, may be ordered from the main collection. More details are on the Melton Library webpage. Further suggestions for communication included Fliers; the Women's Institute; and the Melton Times. When informed that villages in the Melton were soon to be provided with website facilities, out of the 134 that responded 51% were interested and 49% not. 84 households responded when asked if they could access the Internet at home. 70% had access. The websites mentioned above are just a selection of sites available under the various categories. Their inclusion does not indicate any endorsement, and no responsibility will be accepted for their content or its accuracy. When asked whether they would make use of a village database, 120 households responded to the question: 48% said yes but 52% said no. 80% of households subscribe to the Village Journal. All the respondents were happy with the frequency, content, presentation and advertisers. We asked for suggestions on how the Journal might be improved and circulated. Views requested more general interest and humorous art, articles from children, garden tips, a youth section, and local school and playgroup reports. 25% said they would be willing to provide copy. Information: You can obtain a copy of the Journal through the Post Office. The Journal is delivered monthly and is available free of charge for the first month to new residents. 145 households responded to the question about use of the telephone Kiosk. The kiosk is recognised as a public service, especially for people passing through the village, for emergencies and for the youth. If it was withdrawn 15% said it would cause them a problem. When asked if they knew how to contact the local Police, 75% said they did. When asked for views on the level and response of policing, 4% thought it was good; 48% adequate; and 48% poor. 99 households made a suggestion as to how policing and security may be improved. Most wanted to see a beat bobby, with policing nearer to Wymondham. If not available before release of this report, the Parish Council should urgently press for the completion of a new Village Directory to replace the first edition which is now outdated. Local organisations and residents should be encouraged to place information on the Village website. Due to the growing level of Internet access within the parish, the Parish council should approach the borough council and British Telecom to establish a plan for the implementation of Broadband communications. Report information requirements to Leicestershire Rural Partnership to urgently provide a Public Access Point in the village for access to information about local and regional services. The Village Appraisal group to contact the Rural Partnership. Report to the local Police Authority to register residents concerns over policing and security. 73 households responded when asked if they were satisfied with the way the Parish Council can raise money through the council tax and how it was spent. 62% were satisfied. When asked if they knew how it was spent, 67% of Households didn't know. They were then asked if they would be prepared to pay a slightly higher council tax to meet some of the needs highlighted in this appraisal. 121 households responded: 44% said yes; 56% said no. Of those who responded, 37 had views in which area it should be spent. The main areas recommended for increased spending were on traffic control measures and general maintenance around the village, especially in the area of litter and cleaner footpaths e.g. the Backwalks. When asked how well does the Parish Council publicise its activities and decisions: 135 households responded, and of those 7% thought well; 61% reasonably; and 32% poor. When asked if they were aware that residents could attend the meetings 81% said yes. Those that said No said they would attend if the meetings were more welcoming and discussed interesting topics. 90% of households agreed the Parish Council does an effective job. Information: The Parish Council AGM is open to the public and everyone is encouraged to attend. Residents' comments on the possible uses for increased Council Tax have been passed to the Parish Council. The Parish Council should deliver an annual information sheet to every household in the parish (in addition to information on the Parish Council Noticeboard and in the Wymondham-Edmondthorpe Journal). A total of 83 households (85% of those responding) indicated that the village would benefit from a Good Neighbour scheme. Details of those people who volunteered have been put on file and will be contacted as the voluntary services are developed. This will be done in conjunction with the Melton Voluntary Service Bureau. At the launch meeting for this Parish Appraisal Report, volunteers for the range of services highlighted in the report will be requested to add to those who have already volunteered.